The currently being constructed Russian-Chinese pipeline is expected to supply the China National Petroleum Corporation with more than 38 billion cubic meters (BCM) of natural gas every year for 30 years. According to Gazprom, the 1600km Russian portion of the pipeline labeled “The Power of Siberia” is already 75% complete. 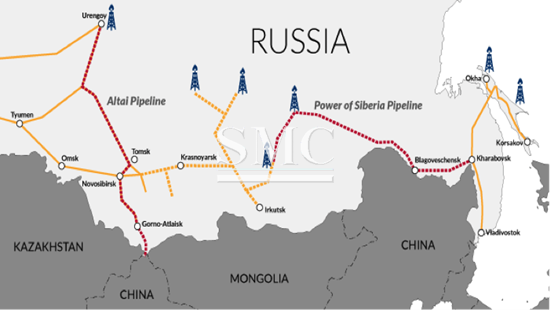 The pipeline is geopolitically important because it signifies an eastern shift in Russia’s export targets. Russia’s crude oil exports originating from its ports on the Black and Baltic Seas are expected to have fallen by 19% from January to the end of May. In the first quarter of 2018, Russian oil exports to China increased by 43% to around 750, 000 bpd. Russia’s export capacity to China has now increased from 15 million to 30 million tons. Decreased seaborne crude oil shipments to Europe may prompt European refiners to buy more Middle Eastern barrels and crude oil from the U.S., analysts say. The pipeline is made from 12 meter long, 1.4 meter wide cold-resistant steel tubes, with a working pressure of 1421 psi. The pipeline is designed to withstand earthquakes by incorporating materials that will deform under seismic activity. The pipes have an internal coating designed to reduce friction and increase the speed of transmission. An external insulation coating is employed to reduce corrosion and increase the lifespan of the pipeline. SMC is set to take advantage of the oncoming demand boom for gas pipeline, with our wide selection of different products, which can be customized to the customer’s specific needs. Our list of products includes but is not limited to carbon steel pipes, stainless steel pipes, galvanized steel pipes, and copper pipes. For more information including product specifications and price, please click here.